Elizabethtown College will begin offering a new major this fall in interfaith leadership studies. It’s the first program of its kind in the U.S., according to Interfaith Youth Core, a Chicago-based nonprofit. Eboo Patel, IFYC’s founder, spoke at the college’s commencement in 2013. Patel is a member of the Obama administration’s Advisory Council on Faith-Based and Neighborhood Partnerships. He has advocated strongly for interfaith studies as an academic discipline and his vision inspired the development of the program, E-town said. Its creation was funded through a grant provided by IYC and the Teagle Foundation, a New York-based philanthropic organization that focuses on undergraduate education. 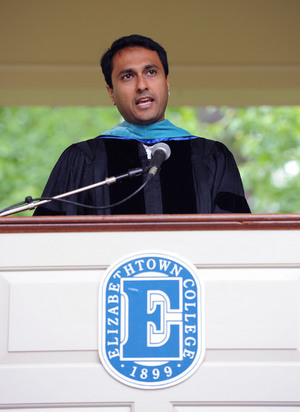 “I expect many other colleges to follow Elizabethtown’s example in the years to come,” Patel said in a statement. The major includes courses in business, political science, sociology “and even biology,” E-town College Chaplain Tracy Sadd said. “It will prepare students for a variety of career pathways, including non-profit leadership, NGO work and careers with faith-based national and international organizations,” Sadd said. It will also be offered as a minor. The first graduates are expected in 2019, E-town said.